So Much More Than Your Standard Volunteer Project! Think Pacific is a life-changing adventure. 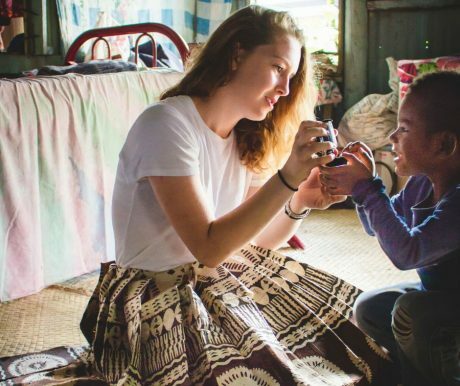 People who volunteer with us see Fiji through the eyes of local people and return with a second home and a second family in Fiji. You’ll make lifelong friendships and shared memories whilst being immensely proud of your achievements. 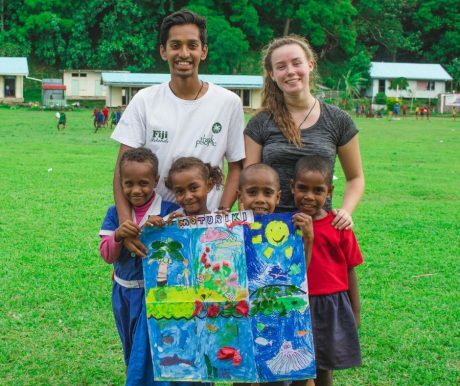 If you want to challenge yourself and be a part of something unique and special then you could join a team and volunteer in your very own village as we inspire children through education and sports projects, which are making a real sustainable difference in Fiji. This is Not Your Average Volunteer Project! What Is It That Makes Us So Unique? 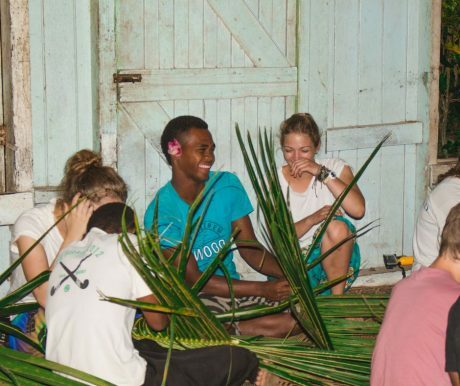 If you’re thinking about volunteering in Fiji, then we’re the specialist organisation for you. Fiji is all we know and love. It’s the only country we operate. We’ve been guiding young people through this breathtaking country for almost a decade. Every member of our staff team has extensive experience of living and working in Fiji. Our knowledge and expertise of this area of the world is unparalleled. We have a team of over 30 staff annually guiding our projects in Fiji, including our experienced management team. We are in direct partnership with the Fijian Government. Our aims were designed by Fijian communities to address Fijian need. 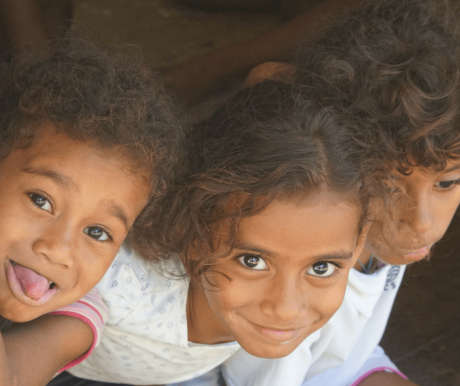 Our Fijian charity is one of the most respected in the country. We only do teams of up to 20 people. You will live, work and travel in a team of young, enthusiastic, slightly nervous, fresh thinking and likeminded people. We aim for a fair mix of male and female volunteers aged 17 -35. 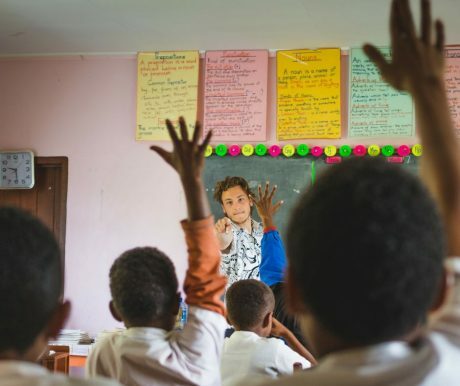 All our volunteers have the same things in common – a sense of adventure, a passion for making a positive contribution, and a desire to experience the real Fiji! The depth of our association with local communities, government departments, charities and local organisations within Fiji is unique. Think Pacific is an organisation built upon collaboration and long term partnerships, of which we are very proud. Our partnerships mean that we achieve community driven action plans in line with government aims. We listen to communities’ needs, achieve projects that wouldn’t be funded by any other means and create supportive environments for children to grow up in. You volunteer for a short period of time, but with Think Pacific your impact is part of a long-term plan, which achieves sustainable charity initiatives. We’re enabling children in the remotest areas of Fiji to have an improved education, more opportunities and the confidence and aspiration to achieve their goals. This is what our charity is for. It’s a long process, but every volunteer and every project makes a significant contribution. 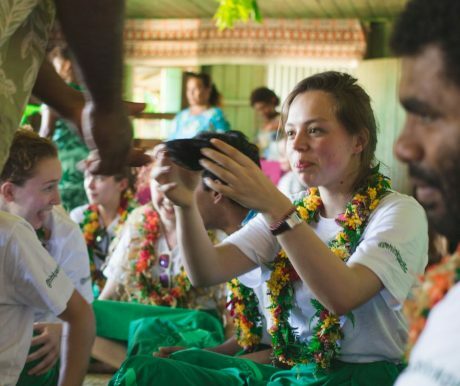 A Think Pacific project is not a holiday, it’s a real volunteer project and a true cultural experience which definitely comes with some challenges and huge personal growth. Living with your fellow team members in remote villages means back-to-basics conditions, cold bucket showers, poor sanitation facilities, eating traditional food, sleeping on a mat in a simple wooden and tin house. You’ll come out the other side with a different outlook on life, better understanding of yourself and a broader understanding of life beyond your day-to-day world. Think Pacific’s staff oversee the project from start to finish in Fiji, backed up by a UK team. Expert expedition leaders live alongside you in the village for the whole experience, guiding each day. We have a team of over 30 staff annually guiding our projects in Fiji, including our experienced management teams in the UK & Fiji. 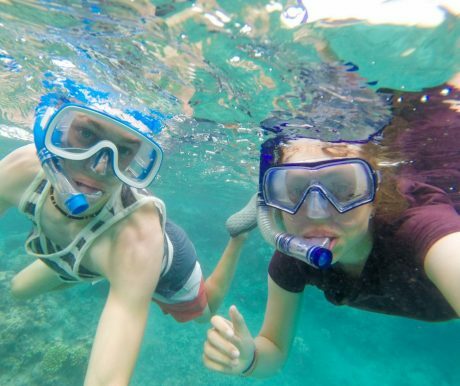 With Think Pacific, this your chance to have an experience far from the tourist trail. The villages in Fiji are accessible by strict chiefly invitation only. Fijian life is incredibly communal, friendly and truly fascinating. The entire village live and work together, adhering to ancient cultures and customs. In the evenings and on weekends you will learn the fascinating ‘Kaiviti Life’. It is truly a privilege to be welcomed into these remote and wonderful communities. We are very proud of our ethical and transparent project fee. 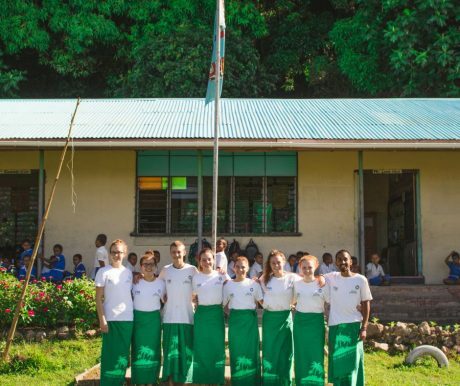 By joining Think Pacific, you can be sure that your money not only provides an adventurous and rewarding experience for you, but is used to make a long term difference to Fijian children. Your project fee has a wider impact than you’ll see just in your village. Through our unique model, you are making a difference to thousands of children and families, some living in areas that are just too remote or simply uninhabitable for us to send volunteer teams. We call our projects ‘expeditions’ because we plan, prepare and guide each one with the care, passion and attention to detail befitting such a unique and challenging team project. 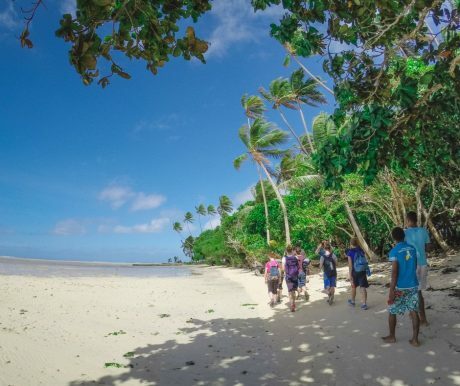 Our expeditions are reviewed by government departments, trusted by world class universities and visited regularly by the British High Commissioner for Fiji. Our experienced Fiji management team support you 24/7, backed up by our UK office. You are under the care of Think Pacific in Fiji and we take this responsibility seriously and with pride. Our leaders guide your project every day, from start to finish, living with you in the community to offer exceptional personal support. We follow thorough risk assessments and strict policy guidelines to ensure your safety and support throughout. You will join a traditional Fijian village and you live with local families. The experience is truly a privilege. 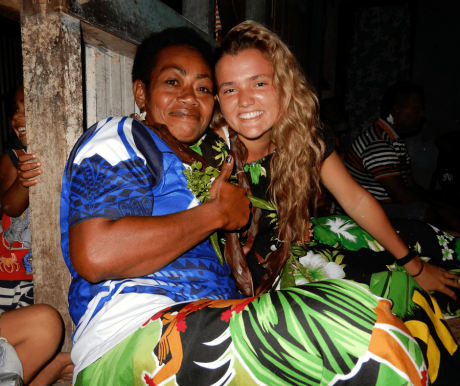 Fijians have a justified reputation for being the friendliest people on earth. Every door is open in a Fijian community and the generosity and genuine excitement of the local people is profound. You’ll experience hospitality, so immense, you’ll be talking about it for years and you’ll form a close bond to the people within your community. By the end of the project our volunteers feel as though they are leaving a second home in the South Pacific. Forget all about the beach resorts or the big towns, we head further. To the absolute heart of the beautiful and remarkable country. Our projects are based far from the tourist trail. Village locations you can only visit by invitation by the Chiefs. And it’s here where you’ll experience the real Fiji and some of the most welcoming communities imaginable. You’ll also get to explore the dramatic scenery as our leaders and local ‘Mata ni Vanua’ guides show you the best of Fiji, from hidden waterfalls and night spear fishing trips to jungle treks and remote beaches that only the rural communities know about. This the Fiji that Think Pacific invite you to experience. Put this all together and what do you have? A unique guided journey to the heart of Fiji only possible with Think Pacific. One which gives you the rewards of challenging yourself and making a difference to a charity which is pioneering real change. Also, a second home in the distant south seas, where you’ll forever be welcomed back with open arms. An adventure of a lifetime, shared with a team of like-minded people. New friendships and stories that will last a life time. 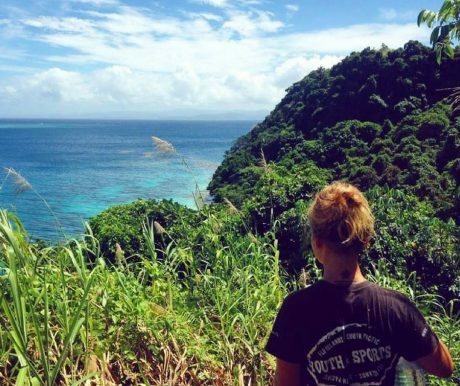 There’s few chances many of us have in life to do something as remarkable as volunteering and to experience somewhere as remote as Fiji. Our promise to you is, if you take your chance – you’ll never regret it.